I was reminded of this interchange from 2011. If you or anyone you know is a deer-eating monster (or something like that), may Christmas and its message change you/them. 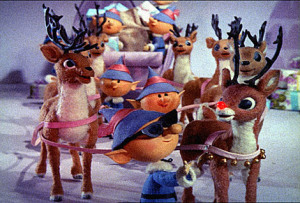 For the first time in his life, my son, Calvin, watched “Rudolph the Red-nosed Reindeer” yesterday. It had been a while since even I had seen the whole thing, and the conversation that ensued was definitely worth the price of the show (which was free thanks to YouTube).